Are you looking for 50's party theme ideas or how to decorate for a 50's theme party? Well fortunately PartyCheap.com has all of the 50’s decorations and accessories you need to rock the night away. The fifties theme is a great idea for reunions and retirement parties now that so many people that grew up in the 1950’s are ready to kick back and relax. But the 50’s party theme is just as rocking for kids as well. The classic 50’s diner, the soda shop, classic cars, and good old rock ‘n roll will never go out of style and make for a fun party theme for office parties, school dances, and even the prom! And the drive-in was such a popular event so add some Drive-In removable wall signs, which you can customize with the name of your event or write in the name of the man or woman of the hour. Use some 50’s themed street signs to line your hallways to guide your guests to your makeshift drive in. Of course once you get inside the drive-in restaurant the focal point was the jukebox that would belt out the rock n roll tunes and where Fonzie was always able to seem to get a free play. 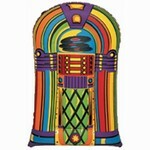 We have several jukebox decorations for you to choose, from a three foot tall jukebox cutout to a jukebox centerpiece and even an inflatable jukebox decoration. The jukebox is such a strong 50’s icon you can go wrong using it too many places at your party. Use the jukebox to tie your drive-in 50’s theme together by using it as a decoration on the walls and by serving up some drive-in meals on the Jukebox paper plates. Keep your food simple with hot dogs and hamburgers with lots of French fries and of course top it off with a classic soda which brings us to our next 50’s niche, the Soda Shop. Just remember that when planning your 50’s theme party you can tie any of these sub-themes together. From rock ‘n roll, to the drive-in, to the hop, you can’t go wrong with the classic jukebox, records, and music notes to make your 50’s party theme go from an idea to a successful party. No matter what kind of 50's party ideas you might have we have got you covered right here! So party with us! We're PartyCheap.com and we know how to party!